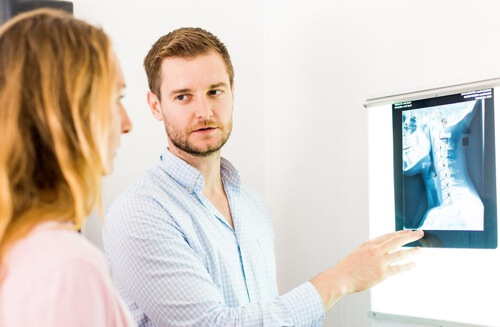 When visiting your chiropractor there is a number of steps in the process of getting your spinal health back on track again, the first is your initial consultation. Your chiropractor will conduct a thorough review of your health history in order to definitively identify your problem, your health goals and make sure our office is the right place for you. Following the review of your history, we will conduct a physical examination to determine the cause of your pains and the health of your spine and nervous system. The physical examination involves gentle palpation of the spine, orthopaedic, neurological and chiropractic tests. If required we will refer you for x-ray imaging which is bulk billed through Medicare and is conveniently located in Monavale. The second visit is often the longest as we will inform you, based on your findings, of the nature of your pains. This will include a review of what was found on the initial consultation, an in depth explanation of your examination, your posture and your x-rays if they were taken. A tailored care plan will be recommended based on the extent of your condition followed by a treatment if required. We encourage you to bring your partner or a family member to this visit as it is important for your loved ones to understand your health goals to encourage support during these times. Chiropractic visits following your report of findings involve gentle and specific adjustments to your vertebrae to take pressure off the nerves and allow them to heal. Different techniques are given based on the patient's needs and preferences. We encourage you to communicate with us during your care so we can serve you best. Techniques range from gentle instrument assisted technique to manual techniques. We encourage patients to take advantage of their health and aim to correct the underlying problems, corrective exercises are given and are assistive in correcting your postural imbalances.